(CNN) -- Mothers often get blamed for the way their children turn out, and a new study gives additional weight to that accusation. Mothers have opportunities to teach empathy every day, psychologists say. The study, funded by the Economic and Social Research Council, found that children whose mothers often talked to them about people's feelings, beliefs, wants and intentions developed better social understanding than children whose mothers did not. The effect persisted when the researchers revisited the families -- 57 of them remained in the study until the end -- on an almost yearly basis. The authors controlled for socioeconomic status and IQ of the mothers and found that these factors were not as relevant. "You can predict even from when the children are 3 or 4 what their social understanding will be like when they're 8 or 9," said Nicola Yuill, lead author and senior lecturer in psychology at the University of Sussex in England. The 12-year-olds, however, generally did as well as their mothers on social understanding tasks, indicating that children at this age can be as "socially sophisticated" as adults, the authors said. For one test of social understanding, children 8 and older watched clips of the British television series "The Office" and were prompted to answer questions about the situations: for example, the way the main character, David Brent, embarrasses people without realizing it. Children also judged other people's feelings from pictures and explained what they would do in hypothetical situations involving other people's feelings. "The communication of empathy is just about the most important thing you can do," said Nancy Weisman, a psychologist in Marietta, Georgia, who was not involved with the study. "Every single moment of the day, you have situations in which you can teach this." Yuill and colleagues are interested in training parents to use these talking skills and seeing what effect that has. 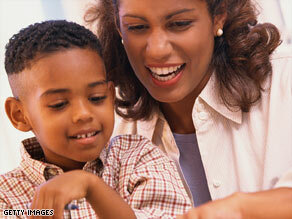 For example, they may show videotapes modeling the way mothers communicate "mental state" talk to children. Weisman recommends to her patients that they use opportunities such as television shows and movies to talk to children about what the characters may be feeling as a result of the actions on screen. If someone is yelling at the supermarket, this is another chance to talk to a child about other people's feelings, she said. It's essential for both mothers and fathers to give children a vocabulary of feelings, said Dawn Huebner, a psychologist in Exeter, New Hampshire, who sees children ages 6 to 12. Children don't always realize what their emotions are and need to have words to describe them in order to become more empathetic, she said. Labeling other people's feelings is also important, Huebner said. "Let's say a young child grabs a toy away from another young child. It's helpful for parents to say something like, 'That makes him sad when you take it,' " rather than saying 'don't grab' or 'stop it,'" Huebner said. But social understanding does not guarantee good behavior, the authors said. Children who showed the most sophisticated social skills in this study also behaved the most negatively toward their mothers in the team task of steering a model car around a race track. This suggests that social understanding isn't everything and must be used in beneficial ways, Yuill said. This negative behavior probably came about because if children feel that they can label their feelings, they're more comfortable expressing a wide range of emotions, said Laurie Zelinger, a licensed psychologist in Cedarhurst, New York, who was not involved with the study. "It would be up to the parent to set some structure and some boundaries, to say, 'No, you can't hurt me,' but it's also a teachable moment," she said. "When you feel angry, you feel like banging into things, you feel like running your car over mine, but you can't hurt me."